REGINA - Joey Dwyer’s punishing hit on Calgary quarterback Jimmy Underdahl forced a turnover with only seconds remaining, sealing a 32-27 win for the University of Regina Rams over the No. 2-ranked and previously unbeaten Dinos on Friday night at Mosaic Stadium. Underdahl had hooked up with Kelton Bailey for a 36-yard touchdown just minutes earlier to get Calgary to within five, and the Dinos looked as if they were about to complete the comeback with a game-winning touchdown as Underdahl streaked towards the end zone from Regina’s 12. But Dwyer rocked the Calgary pivot with a crushing hit on the one-yard line, jarring the ball loose with safety Braedy Will right there to jump on it for the turnover. The win puts the No. 9-ranked Rams (3-1) into first place in the Canada West standings. Calgary is also 3-1, but the Rams will hold the tiebreaker as Friday was the lone meeting of the Canada West schedule for these two teams. “When these guys start to believe, they can accomplish just about anything and we saw that out there tonight,” Rams head coach Steve Bryce said. “We didn’t even play a full four quarters of football tonight, so I’m really excited to see what these guys can do when we finally put it together for all 60 minutes." Down three starters on the offensive line, the Rams couldn’t get much going on the ground and almost completely relied on their vaunted aerial attack. And fourth-year slotback Mitchell Picton was the primary weapon, collecting 13 passes for 215 yards and catching three touchdowns in a span of under 14 minutes in the second half. Riley Wilson also had a big game, catching five passes for a total of 124 yards while Ryan Schienbein had three catches for 87 yards. Noah Picton completed a season-low 23 passes, but had the deep ball working for a large majority of the game and finished with 452 yards and four touchdown passes. Making his first start for the U of R, rookie defensive lineman Nicholas Dheilly joined Stan Van Sichem and teammate Michael Stefanovic as the only Rams ever to collect three sacks in one CIS game. Stefanovic also had a sack to give the Rams four for the game. Dwyer was also in on a team-leading 14 tackles to go along with his game-winning forced fumble. The Rams (3-1) will now prepare to open up the new Mosaic Stadium next Saturday in the SaskTel Fall Classic against Saskatchewan, which is 2-1 this season and plays Manitoba on Saturday. Calgary is back in action next Saturday at home against Alberta (0-3). 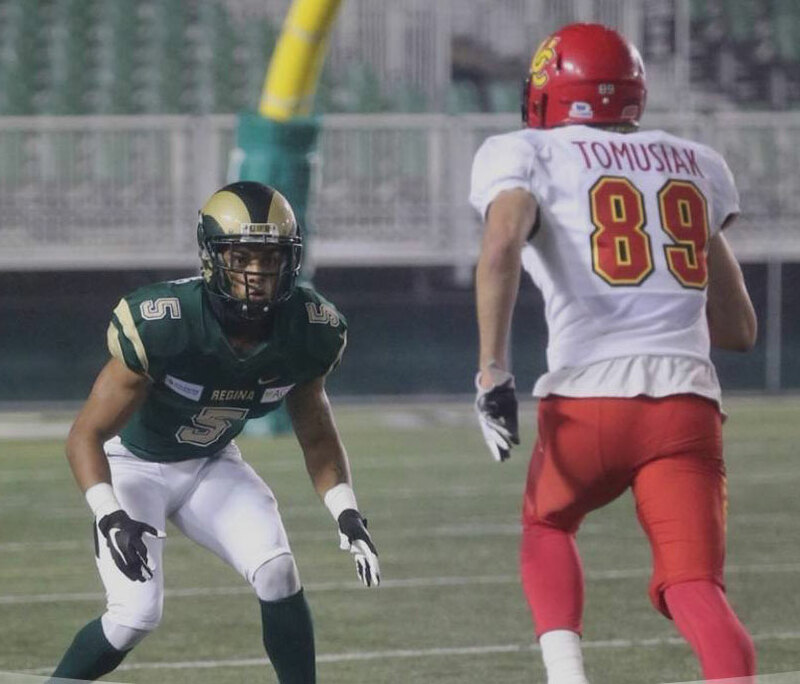 NOTES: Picton’s total of 215 receiving yards is the fourth most in a CIS game by a Rams player … he also joins Jason Clermont, Chris Getzlaf, Chad Goldie, and Michael Thomas as the only Rams ever to catch three touchdowns in a CIS game … his 13 receptions ties marks held by Davin Johnston and current offensive coordinator Mark McConkey for second on the school’s single-game list … Noah Picton surpassed Mark Anderson for third place on the U of R’s passing yards list … he also leapfrogged Marc Mueller for third in school history in career touchdown passes. Going to be a great game in the new stadium next Saturday.